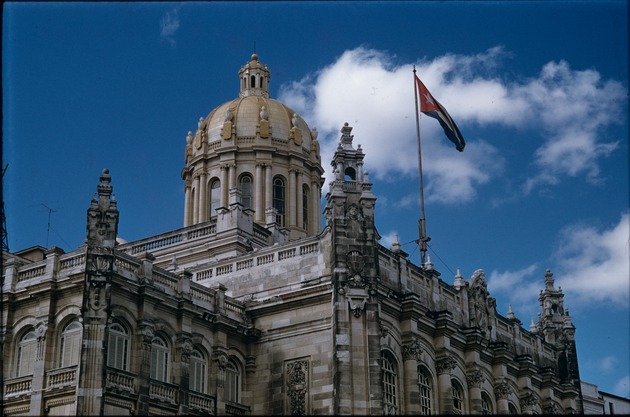 Pictured is the dome of the President Palace with a Cuban flag. The former Presidential Palace, built between 1913 & 1920, now houses el Museo de la Revolución. The palace was the place of the failed assassination attempt on US-friendly dictator Batista in March 1957, by revolutionary student leader Jose Echeverria. The museum follows Cuba's history from pre-Columbian culture to present day socialism. The former Presidential Palace (presently Museo de la Revolución) was designed by the Cuban architect Carlos Maruri and the Belgian architect Paul Belau and was inaugurated in 1920 by President Mario García Menocal. It remained the Presidential Palace until 1959. The building has Neo-Classical elements.